History: (Avengers I#267 (fb) - BTS) - Iron Man aided the Russian mutant Colossus smuggle his family out of Siberia, escaping Communist rule. (Avengers I#267 (fb) - BTS) - Colossus, along with the mutant Storm, joined the Avengers. (Avengers Forever#11) - Both Storm and Colossus were plucked from time to battle on behalf of Kang during the so-called "Destiny War." (Avengers Forever#12 - BTS) - Storm and Colossus battled numerous Avengers plucked from their respective realities and were sent home following the War. (Avengers I#267 (fb) - BTS) - Not long after she had joined the Avengers, Storm was called away to quell a gulf coast hurricane. (Avengers I#267) - Upon her return, Storm was welcomed home and surprised to see numerous reporters. Wasp informed her that the reporters were there due to their other new member Colossus, who was conferring with the President. A nervous Colossus soon confronted the reporters side-by-side with President Reagan, where he was bombarded with questions about his Soviet origins. Reagan quickly reminded the press that Colossus was a former Soviet citizen and that he was sure Colossus would make a fine citizen. Soon after, Iron Man (who was actually that Earth's Kang in disguise) arrived and Reagan introduced him as the man responsible for bringing Colossus to the Avengers. Iron Man then informed Reagan that his employer, Tony Stark, had asked him to give him a briefcase. Happy to recieve a gift from Stark, Reagan struggled to open the briefcase with Colossus asking if he needed any help. 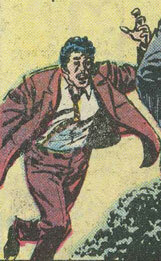 Suddenly, Tony Stark came running up to the Mansion, yelling for Reagan to stop trying to open the briefcase. Thinking him to be a bum, the President's secret service halted Stark's progress, explaining how he had made a big mistake. Stark frantically tried to explain that he was Iron Man, but before he could, Reagan managed to open the briefcase, setting off the nuclear bomb inside and killing himself, the Avengers, and everyone within the bomb's radius. Once the mushroom cloud had settled, "Iron Man" revealed himself as Kang and gloated about another victory over the Avengers before he was plucked outside of time by the Council of Kangs. The Council revealed to Kang that he had left nothing of the alternate Earth he had just visited due to America thinking that the nuclear device was a bomb sent by Soviet Russia, causing a chain reaction that eventually destroyed the world, leaving Kang as the only survivor. Comments: Created by Roger Stern, John Buscema, and Tom Palmer. This Earth diverged from a similar Earth, when this Earth's Kang managed to do what his counterpart on that Earth could not. Both Earths diverged when Iron Man aided Colossus in freeing his family from Soviet rule, as opposed to Colossus leaving with Charles Xavier to join the X-Men. Arnie was never seen in the story, only mentioned by a reporter. Iron Man was never seen in armor in this armor, although Cap referred to the Iron Man imposter Kang as "Iron Man," so Stark was active as Iron Man. Arnie was a photographer who was present when Reagan opened the briefcase. He was immediately killed by the bomb. Captain America was basically the same as his Earth-616 counterpart, up until Kang, posing as Iron Man, detonated a nuclear bomb that killed Cap and the other Avengers. 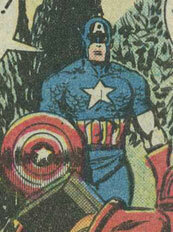 He presumably had the same Super-Soldier Serum-induced physical attributes. Colossus was a Russian mutant that Iron Man aided in getting his family out of Siberia and away from Soviet rule. Colossus soon joined Iron Man in the Avengers and almost immediately after joining, was plucked from time by Rick Jones' destiny powers to aid Earth-616's Kang against the Time Keepers during the Destiny War. Upon his return, Colossus prepared to greet reporters at Avengers Mansion with President Reagan. Soon after doing so, however, he was killed when Kang posed as Iron Man and detonated a nuclear bomb, killing everyone present except himself. Colossus had the same ability to transform into organic steel as his Earth-616 counterpart. Hercules was the same as his Earth-616 counterpart up until Kang detonated a nuclear bomb, killing everyone within its radius. Hercules had the same godlike physical attributes and longevity that his 616 counterpart possessed. Tony Stark was the armored hero Iron Man and was similar to his Earth-616 counterpart up until he aided the Russian mutant Colossus in freeing his family from Soviet rule. Colossus soon joined the Avengers and during a press conference, Stark arrived, raving about how the "Iron Man" present wasn't the real Iron Man. He quickly tried to stop President Reagan from opening a briefcase given to him by the false Iron Man, but he himself was stopped by the President's secret service. Reagan managed to open the briefcase, revealing a nuclear bomb that destroyed everything in its radius, including Stark. Like his Earth-616 counterpart, Stark wore a suit of armor of his own design, equipped with various weaponry. Kang was basically the same as his Earth-616 counterpart up until he plotted to destroy the Avengers with a nuclear bomb. Succeeding, Kang accidentally started a chain reaction that destroyed the world when the U. S. mistakenly thought that Soviet Russia was behind the bomb and retaliated. The retaliation sparked a nuclear war that wiped out everyone on the planet except for Kang himself. Seconds after the bomb's detonation, Kang was plucked from time by the Council of Kangs and shot dead by them. 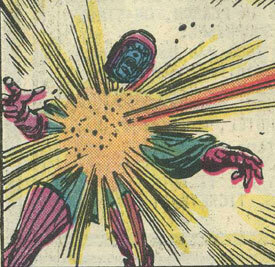 Kang had access to weaponry from all eras of time, like his Earth-616 counterpart. Ronald Reagan was the same as his Earth-616 (and real life) counterpart up until he helped Colossus answer questions at a press conference. During the conference, Kang disguised himself as Iron Man and gave Reagan a briefcase that he had trouble opening. Upon finally getting it open, Reagan was killed instantly when the briefcase was revealed to be a nuclear bomb. Storm was a mutant able to manipulate the weather who joined the Avengers. Soon after joining, she was plucked from time by Rick Jones' destiny powers to aid the Earth-616 Kang against the Time Keepers in the Destiny War. Upon her return, she helped stop a hurricane and then arrived back at Avengers Mansion to see the press conference announcing Colossus' membership into the team. 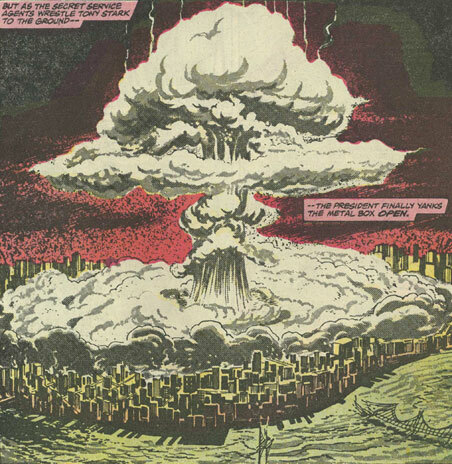 During the conference, this Earth's Kang set off a nuclear bomb that killed everyone present, including Storm. 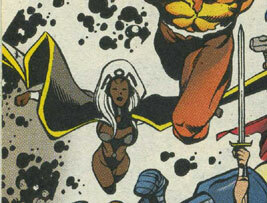 Storm had the same weather-manipulating mutant powers that her Earth-616 counterpart had. Wasp was the same as her Earth-616 counterpart up until she was killed by the nuclear bomb set off by Kang. Wasp had the same shrinking abilities as her 616 counterpart, including the wings and bio-stings that came with it.